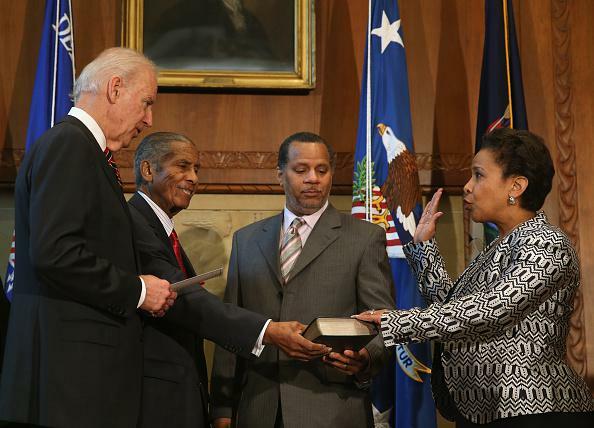 Loretta Lynch swearing-in: Father Lorenzo Lynch holds Bible. From right: Loretta Lynch, her husband, Stephen Hargrove, her father, Lorenzo Lynch, and Vice President Biden at her swearing-in on Monday. After a long and largely pointless delay, the Senate confirmed Loretta Lynch as the United States’ new attorney general last Thursday, and on Monday she was sworn in by Vice President Biden. Biden’s remarks mentioned Lynch’s father, Lorenzo, who drove six hours from North Carolina last week so he could see the Senate confirm his daughter in person. The elder Lynch is a retired Baptist minister who was involved in the civil rights movement and sometimes took his young daughter to observe proceedings at their local courthouse, and when it came time for Lynch to be officially sworn in, he (alongside Lynch’s husband) held the Bible that she used to take the oath.